Do children sometimes know that the eleven plus journey, and what lies ahead, is beyond them? This is not saying that the child does not want to do the work but simply asking if a child knows that a grammar school education is not for them. If any person’s going to die. That’s why nobody talks to me. She’s made me promise not to say. For fear I’ll say good-bye to them. A blog about technology may not have entered the mind of Strong – but having looked at his Wikipedia entry with the obvious tremendous grasp of words and ideas he employed, I can’t help thinking that he would have loved the ipad. Tony Vincent in http://learninginhand.com/ makes a compelling case for using technology in education. Would he have written a very different poem if he had been able to watch children using ipads for education and play? Do some eleven plus parents sometimes hope for some form of intervention to help their eleven plus candidate suddenly acquire the necessary work ethic to be able to pass the eleven plus? The Ancient Greeks may also have been faced by a similar mixture of hope and dreams. The term `Deus ex machina’ was used to describe the `the god from the machine’; this was a mechanical device in Greek drama that was lowered onto the stage. The god represented the intervention to provide a solution to the dramatic conflict. The `Deus ex machina’ can be used by needy eleven plus parents to resolve a situation. Once a parent is being out argued and out witted by their eleven plus candidate then the big guns of the unexpected can be brought to bear. Is this fair? Of course not but the eleven plus is the eleven plus and there can be no holds barred. Winning, to some is all! Our first Scratch program for Eleven Plus pupils starts on Saturday. Scratch comes from the MIT – long known as one of the world’s top universities. The course will cover getting familiar with the Scratch environment, working on some simple projects and then, we hope, branching out into projects where elements of eleven plus work are developed. Scratch will help children to program sound and movement. They will meet logic and sprites. The children will also be able to share their projects over the internet. Surely learning how to debug an application is a vital part of learning? It is always interesting to read and reflect on what others think. The eleven plus examination, or a similarly named entrance test, and the drive to help poorer children into top schools, has been in a state of change for many years. Thousands of teachers over the years have done their best for their pupils. I have worked with over forty three thousand children during my teaching career – but there is always the excitement of a child making progress and parents willing their children forward. But looking back won’t help many children writing the new style selection tests this year. The `new style’ tests are, once again, as cramming free as possible. Questions of numerical reasoning and comprehension are supposed to give a wider range of children the choice of a grammar school education. Jeff Utecht, an American advocate of change, made the point that we need to look forward in education. We cannot drive education forward by looking in our rearviewmirror all the time at what used to work, what used to be good, and what weused to teach. Driving through your rearview mirror is never a good idea. Theroad ahead is full of opportunity, if we focus on what can be rather than whatwas, 2013 will be a fantastic year! In Year 5 there are children who take eleven plus examinations. Some authorities used to allow all children the opportunity of sitting the examination. Today there are some authorities where parents and children are offered a choice – and have to register to enter. At the beginning of year five some parents may remind their eleven plus children about Pythagoras for a number of reasons. One could be because five times any number ends in five! This could help with many different types of multiplication and division. It could also help a lot when tricky little exercises on down on lowest terms. Of course five is the hypotenuse of the smallest Pythagorean triangle. 5 = 12 + 22. This may not come up on an eleven plus paper – but may entertain a bright Year 5 child. Of course some parents may feel that their child needs to do at least five hours of eleven plus work a week. The eleven plus preparation may be timetabled or may take place in an ad hoc environment. The latter may offer more opportunities for negotiation and discussion – and this could be a vital part of eleven plus preparation. There is a blog in the Rossendale family of schools – wherea teacher reflects on the value and nature of negotiation and choice. Some parents may take heart from the reasons why children are sometimes allowed to make their own choices. And finally the number five is the amount of times a parent needs to remind a child to settle down to work. After the magic: `I’ve told you five times’, sanctions are perfectly permissible. 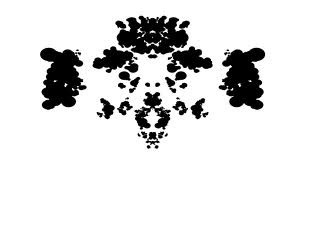 The Rorschach Test was developed as a projective test. In projective tests a highly unstructured or ambiguous set of stimuli is presented. The idea is that the person being tested is encouraged to bring his or her own unique meanings and organisation to the situation. He or she does not know what inferences the tester intends to make, and so may reveal some hidden reaches. There are ten cards, each of which contains an ink blot. An eleven plus child doing a multiple choice test would be urged to consider the four responses carefully and decide on the answer which best fitted the question. In a Rorschach Test the pupil would be asked to look at the ink blot designs and ask what might be presented. In the diagram above one response could be two rabbits fighting over a lettuce leaf while someone else may suggest a voodoo dancer spinning between two poles. Could either answer suggest that a child deserves a grammar school place? Do grammar schools need children who can choose one out of four answers or creative children who can think for themselves? Your posts on this subject are interesting and thought-provoking. As a Digital Media teacher I do try to help students develop creativity (or creative approaches to problem solving.) So...I do need to give them feedback on it, i.e. assess. Ric, I am still thinking about this one. It's one of the most thoughtful attempts at measuring creativity I've seen. I really like that it is used, as you write, as "a framework for conversations." But my main question still persists: Do we really want to evaluate creativity in and of itself - or do we want to evaluate the impact creativity may have on the effectiveness of a product, a solution, or a task? I'm guessing you will be asked by many for permission to use this tool! Shawn – no relation to me as I am Shaun – argues that that there may be a case to try to remove the constraint of a syllabus and allow pupils to spend more time projects and in-depth investigation. I remember reading about a similar scheme to abolish class schedules years ago when A.S. Neill was writing about Summerhill. Children could choose if they wanted to work or play. If they did opt to work they could choose what they wanted to do! As a young teacher this was vastly appealing to me. We had to hand in our schedule for the week to our Head Teacher, Mr W.W. Wilson, every Friday before break. I used to take the school, of 600 pupils, for singing for an hour after Friday's assembly – which allowed the rest of the staff time to write their lesson plan for the week. At the Extra Tuition Centre lesson plans are now generated by our computer based program called Action. Progress! Summerhill is the name of a small school – but it signified a great experiment in education. Neil, who did not pull any punches, talked about a pupil – Moroslava – who did not respond to him. When I look at some eleven plus children working through eleven plus papers I often wonder if the nails I am supplying are sharp enough to help the child break through the eleven plus yoke! Some authorities are trying to change elements of the Eleven Plus. Some critics have maintained that the eleven plus is far too prone to being influenced by careful coaching and preparation. There is no doubt that some children can be taught certain types of questions. Bexley, for example, are introducing this new style of testing this year. There is a fascinating article in the New York Times on critical thinking.I wonder how many eleven plus children could answer the question? After all we do want children who can think as well as pass eleven plus examinations. Don't we? apply to progress in the eleven plus? Larry Ferlazzo has gathered a collection of thoughts and ideas on sleep from a variety of web sites. He comments on recent articles on sleep. Could some of our eleven plus children do better on papers and exercises - and in the examination if they had more sleep? Perhaps some parents may be interested in maintaining a little diary - looking at the relationship between sleep and academic success? My book by Webb on `Sleep: An Experimental Approach' (1968) looked at sleep in a variety of ways. You can even get a copy of this book on Amazon! I sometimes used to wonder if Wilse B. Webb did not have a wonderful life's work - just watching people sleep! The Eleven Plus seems to be becoming more and more dominated by the internet. In the `olden days’ an authority would set a test. Teachers would help their children to prepare. Each teacher would have his or her own methods of preparing the children. Bit by bit publishers cottoned on to the idea that a book or series of papers would help children to prepare. The internet came along. Everyone and anyone can become an eleven plus expert. Word of mouth is still very important – but communication can be over great distances as well over the garden fence or in the playground. 1) Do the most exciting technology-rich learning opportunities in your school go to the most-advantaged students? 2) Is your school using technology to gain efficiencies in old practices, or to do things that are truly different? 3) Does your school teach students to be afraid of making bad decisions on the Internet? Or do you teach students how to create a digital footprint to be proud of? 4) Do rubrics for online projects evaluate students' ability to demonstrate their understanding, or do they measure compliance concerning criteria like length, number of posts, number of pages, etc.? 5) To what extent is your school measuring the impact of your technology investments? Could you prove to your stakeholders (parents, school boards, trustees) that the vast sums invested in technology are making a difference in student learning? 6) Does your school have a coherent vision that defines high quality learning? Is your technology plan specifically designed to serve that vision? 7) How does your school prepare students for a world where the vast majority of learning takes place outside of school? The questions are not about the eleven plus – but do show how others are viewing the impact of how our `digital age eleven plus children’ are being prepared for the future. The organisation that are the `publishers of the actual 11+ tests’ – GL-Assessment supply tests, according to their webpage, to three million pupils a year. GL-Assessment also publishes 11+ tests and papers. Gl-Assessments used to be NFER – the National Foundation for Educational Research. Some authorities, and independent schools, now use the Centre for Evaluation and Monitoring (CEM) of Durham University. How do you know if your child is bright enough to benefit from a grammar school education? Over the years many parents have followed the theory that there is a strong relationship between early training and the degree of intelligence or ability. We can look at Thomas Babington Macaulay who became a poet, a historian and a statesman. He was educated at home by his parents before he was encouraged to go to school. Before he was seven he wrote a compendium of universal history. He started at the Creation and ended up with an account of present day events. When he was eight he wrote poems about historical characters. It is thought that the majority of men and women who went on to do well in life were offered considerable support and help from their parents. Some parents of the very bright took considerable pains to ensure that their children had learned their lessons. When I was a child we thought that giraffes developed their long necks when they were foraging for food. The really tasty leaves, for giraffes, were at the top of the acacia trees. Acacia trees are sometimes called `thorn trees’ – so a long neck was useful when gathering food. There was local folk lore that crushed seeds from the acacia tree were useful in helping with rabies! Can you ask an eleven plus child a question if you are not completely sure that you know the `correct’ answer? If the question appears on an established eleven plus paper or in a school text book, and seems to be reasonably genuine, then it may, sometimes, take courage to question the answer. Suppose you ask: `What is the opposite of white?’ Then your bright, alive and an alert eleven plus child should know the answer. If it looks as if there may be more than one reasonable answer - then there may be a case for concern. In some of our centres we are offering children wider and different comprehension passages to work through. This is because some children will meet questions in the eleven plus examination where they have to read short passages and supply the answers. Text book type answers are required in the examination. These are answers where there is a right and a wrong. We are meeting, however, bright children who appear to prefer to adapt or embellish the answer. These are children who are used to thinking and reasoning. Perhaps they are even children who have been taught at school and at home to think and to question? In some questions children may be asked to explain the meaning. The questions will probably start with the words: “Explain the meaning” or “What does the writer mean by?” Parts of the eleven plus have for a long time been dependent on vocabulary. Some children may not need a wide vocabulary to be able to come up with a plausible answer! Sometimes it may be possible to emerge with a plausible answer even if the phrase or question is not clear. If the question asks the reader to refer to something in the passage then finding the answer may be reasonably straight forward. If, however, the questions asks for an explanation of a relationship between two passages or events then different parts of the passage may have to be understood and appreciated. A very pleasant mother remarked to me that she was trying to condition her son to do a little more work on the eleven plus. When I was a child our family used to visit the home of a headmaster. This is the man who threw his child into the swimming pool to encourage the mite to start swimming. The family had antimacassars because the headmaster (father) used brilliantine on his hair. Brilliantine was used as a hair conditioner – but also by men in an attempt to make them look `brill’. In other experiments animals were only rewarded, having been conditioned, to be fed on the tenth press of the lever. Sometimes a rather diabolical experimenter would only allow a pellet to be expressed every ten minutes. Of course some experiments allowed food to be offered whether the lever was pressed or not. The mother and I were talking outside an aerobic room where thirty young women were intent on conditioning their bodies through a series of contortions. Poor bodies! What an instructor! Did the word `condition’ enter the mind of our eleven plus mother because she could see the writhing of bodies? It was suggested, very gently, that it was not necessary for a child to do eleven plus work every day. The conversation also covered the point that rewards could be given at any time – and not just for eleven plus work. There was also a mention that excess hair conditioner would not necessarily help with stimulation of the eleven plus brain. We also touched on the point that it was no good throwing a child into the deep end of eleven plus work. Gentle coaxing could play dividends! The Chinese have a wonderful celebration at the Chinese New Year with fireworks to celebrate renewal and to ward off evil spirits. The celebration is a traditional part of China’s family day. The parade in London today was noisy and full of action. In spite of the rain crowds lined the streets to watch the action. China Town itself was heaving with Chinese and other visitors. We watched it right beside Trafalgar Square. There were stalls selling little gifts. I did not notice any books or papers. Even when we entered a few super markets we could not find any eleven plus books. Perhaps the books and papers were hidden during the celebration! We all need a break from the eleven plus at times and the Year of the Snake offers a wonderful opportunity. The Year of the Snake revolves around steady progress and attention to detail. The Eleven Plus demands steady progress and attention to detail. This could be a very lucky year for many eleven plus children! There are new forms of eleven plus testing being developed. In the past tests of intelligence suggested a normal distribution of intelligence in the general population. This suggested a few high scores, a few low scores and most of the scores clustered around the average or `mean’. The argument at the basis of the normal curve of intelligence is that because factors like height and weight follow a normal curve of distribution then so should ability follow a similar curve. Does a normal distribution of shoe size also count. Could it be that tests of ability are designed to produce a normal curve of distribution? Could even the new eleven plus tests be manipulated in such a way that a normal curve of distribution is reached to the satisfaction of the test builders? Some of the new style eleven plus tests look at aspects of verbal and non-verbal ability, comprehension and numerical reasoning. If the provenance, however, of the new eleven plus tests was tested against the old style tests then is it likely that the veracity of new tests is also flawed? Wiseman of Manchester University back in 1962 maintained, however, that a selector did not need to be concerned with any hypothetical ability. He maintained that as long as the eleven plus test selected children who were able to benefit from a grammar school education then the test was worth using. If the eleven plus tests are trying to test the potential of children only at the top end of the ability scales – then do test authors need to consider the ability of children at the lower end? There was a theory that was floated at odd times that it may be easier on the emotions of eleven plus parents and children if a rectangular system of selection was adopted. All those children who fitted into the box could pass. If you were not in the box you could not pass! This, in theory, should cut down on the number of children in the borderline zone. Was this the origin of the phrase: `thinking outside the box’? Do eleven plus parents, however, interpret this as: `thinking inside the box’? Did Tennyson Write About the Eleven Plus? When you were at school you may have studied a little Tennyson. His epic `In Memorium’ may have been looking ahead to the eleven plus! During the eleven plus years parents and children will experience highs and lows. There will be times when a wave of action seems to be taking place – and at other times the eleven plus examination will seem to be far away. Some authorities are changing from the GL (Grenada Learning) eleven plus led examination to examinations serviced by Durham University. For years the advertising slogan of the `Official’ eleven plus papers may have directed parents to buy their papers. The Official 11+ Practice Papers offer the most authentic practice available for the 11+ - learn more about our Variety Packs. Asthe publishers of the actual 11+ tests that the majority of children will sit,GL Assessment's Official 11+ PracticePapers are the most authentic revision titles available, informed bylong-standing specialist expertise in the 11+ and in wider educational assessment. If Tennyson had had an eleven plus child we could imagine him writing about the relative peace in the home before `Eleven Plus Fever’ struck. He could even have written about how families have to change to accommodate the impact of a child writing competitive entrance examinations. Where he talks about the sound of the street overtaking the peace and beauty of the sea he may have penned an extra ode to the hustle and bustle of the eleven plus year. The Eleven Plus examination will pass – but the consequences of passing or failing may dwell for ever! We possible think about the sentiments of Jacob Moleschott at least once a week. Some of us may heed his words once a day! It is, however, very important to know that Jacob Moleschott was a philosopher and a physiologist and he lost his job after some of his suggestions. Of course you know that your eleven plus child needs the three fuels of air, food and water. There is no room in this list for the fuel of: `excessive eleven plus study’. Do you remember the research that found that a maid dusting a professor’s room expended more energy in five minutes than her employer did in an hour of concentrated study? Memo: Some snacks in the middle of eleven plus work are wholesome – many snacks signal boredom and a desire to escape from work! And so we come to cabbage. Cabbage is supposed to be able to detoxify the stomach. Eating cabbage is also supposed to help the workings of the upper colon and of digestion in general. Before starting on an eleven plus exercise some parents may care to consider the value of the “Eleven Plus System Smoother”. Juice the ingredients and serve. Could there ever be a case for allowing eleven plus children the time to play with numbers? To some parents and children the eleven plus has the potential to become a serious endeavour and quest. The eleven plus HAS to be passed. We can count ourselves lucky that not all children, with enough ability to pass the examination, want or need to pass. A considerable part of the eleven plus is dealing with numbers. Some areas are even looking into a `new’ style of test where children are tested on Numerical Reasoning. Understanding and manipulating numbers plays a large part in being able to cope with certain types of numerical reasoning questions. Children sometimes have to organise numbers into groups or sets. If the question is asking, for example, about the number of buttons on a shirt – then the candidate may possibly draw on his or her knowledge of shirts and organise the buttons and shirts into groups or sets. The eleven plus child may find it hard, however, to organise all the shirts he or she has ever owned. Should there be a set of all the two year old shirts, or all the school shirts or even the shirts only worn on holidays? Somewhere along the line, we hope, the eager candidate’s thoughts may return from an idyllic holiday on the beach and return to the question in hand. If a far- away look enters the eye – and the attention seems to wander – then your son or daughter may be wondering where this year’s summer holiday will take place. We then need to think: Should we include only white school shirts worn in Year 5 or all the shirts work in Year 5? Each attribute defines a set. Would it complicate the issue if we said all the shirts worn in the year and especially the white school shirts? We now come to the question. A child’s wardrobe contained 5 white shirts, 4 red shirts and 6 blue shirts. What is the chance of picking the following? A blue shirt - once one red and one white shirt had been removed? During the process of solving the question your child may ask you when the family are going on holiday again! Aspects of Non Verbal Reasoning are supposed to be reasonably culture free. Matrices, for example, are questions children meet in non verbal reasoning exercises aimed at testing ability. Many studies were done on the `Ravens Matrices' to investigate how different societies interpreted the items in the tests. Can mathematics be culture free? Five pus five will equal ten in any language. The sum of the angles on a straight line will always equal one hundred and eighty degree. But who said that the sum of the angles in a triangle must add up to one hundred and eighty degrees? Cultures must, to a degree, have their own mathematics language. Can questions in the eleven plus be rated as culture fee? If we take a question that parents would probably have met when they were at school – could we say that this question, and the method of solution, is culture free? A bike is travelling 1.78 metres in a second. How many kilometres an hour is this? Some parents will be able to use the skills they learnt at school and university to help their child to answer the problem. Tell this to the parent of an eleven plus child! Does the eleven plus tax the mind? It taxes the mind and the emotions! By the way the teacher talking about moving from the secondary field to the primary was in America, in New York, in a newspaper article around 1892! The eleven plus is supposed to predict future success in academic subjects – and is supposed to pick out the best and brightest. What happens if one day parents revolt? Children who are good at spelling at not the only ones who can pass eleven plus verbal reasoning papers! The eleven plus should not tax the minds of well-meaning parents! At the turn of the century, around the time of the Boer war, there were allegations that that between 40 and 60% of men enlisting in the army were unfit for military service. England, being England, appointed a committee called: `The Inter-Departmental Committee on Physical Deterioration’. Their report in 1904 was responsible for the establishment of the School Medical Service. The Education (Provision of Meals) Act of 1906 allowed authorities to provide free school meals to children. When two and a half million men were recruited for the First World War the number of unfit men had dropped to around 30%. It is likely that the majority of parents of today’s eleven plus children will be very aware of the need for good food and sound nutrition. This is not to say that the children should not be treated. What about a Squidgy Chocolate Log from, Delia Smith’s 1978 Complete Cooking Course as shown on the BBC? This cake does not have any flour so it won’t put too much weight on the hips of the family. This serves around 8 people – but it is unlikely that there will be any left. A truly cruel eleven plus parent could ask for the total grams but more enlightened parents will simply share the spoils! Could it be fair put a label on a child if he or she has not passed the eleven plus? Is the child then a `loser’ or a failure’? We must all hope not! The eleven plus examination tests skills that some children are good at. Other children may be better at other things. Some children may struggle with parts of the eleven plus because they have some form of a learning problem. Some children mature significantly later than others. When a child is presented with a problem that is outside of the known `comfort zone’ then some children may have the potential to become over active or even aggressive. Interested parents may sometimes ask the older members of the family about relatives to try to establish if there is a family pattern of `late developers’. There could be one picture of an eleven plus child holding up a cup. Parents would be gazing proudly at their offspring. The second picture would be of a nerve with a coating of `Real Myelin’. 87% of 150 Eleven Plus Parents. Parents would be able to deals in the playground selling `Real Myelin’ in sealed cans. The future of the eleven plus is here now! A man, possibly the father of an eleven plus child, was out for a walk one day. He was in deepest China. He suddenly came across a tiger. He grabbed a vine and swung himself over the nearby cliff. He looked up in terror – the tiger was peering over the edge – saliva dribbling from its jaws. Hurriedly the man looked down and, to his horror, there were two more tigers looking up – just waiting for him. Just above his reach two little mice started biting away at the vine. The mice did not respond to his yells and kept on munching away. But, could this be the real story? The sweet smell of eleven plus success!